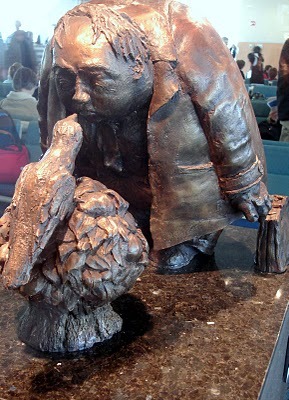 The next time you are flying by way of the Vancouver International Airport take the opportunity to appreciate the numerous art pieces spread throughout the airport. Most are there for display purposes, some pieces are very large and many pieces are for sale. Inuit and First Nations’ (Northwest Coast) art pieces are included along with contemporary artwork. Here is a photo of an amusing piece that is in one of the departure lounges. It depicts a man looking at a mocking bird. Unfortunately information about the artist was not clearly visible.